Regardless which client you choose to manage your server instances, all changes are persistent in the XML configuration file with a consistent state and, as fallback, all changes are versioned in the configuration history directory of the application server. By default all remote connections are secured. The management concept is based on the detyped management API. All management clients of the application server use this detyped management API to interact with the server. This library is called jboss-dmr. The primary class is the ModelNode as basic type. The ModelNode is a generic wrapper for the representation of the manageable resources of the application server. The resources are identifiable by unique addresses. All ressources provides generic operations, such as wirte or read operations. The Command Line Interface (CLI) is the most powerful management client to manage domain and standalone server. It provides a lot of convenient operations and a Tab-completion. The CLI is launched with the jboss-cli.sh or jboss-cli.bat script located in the bin directory of the application server. By default, the CLI connects itself to localhost on port 9990. Connections to a remote server are also possible, by adding the host and port as additional parameter. CLI commands are an ordered map with addresses of resources and an operation. In addition the Command Line Interface supports some nice features, such as Batch-Mode, Non-interactive Mode with CLI-scripts, and a command history. The CLI can also be used with any JVM-based scripting language, such as Groovy, Jython, etc. The source code below shows a simple Groovy script that connects to a local server and executes a CLI commando to read the current server state. To execute the script the jboss-cli-client.jar must be added to the classpath. The CLI API can also be used in Java programs. Another management interface are the RESTful Interfaces with a JSON representation of the mode node. The REST API is accessible through the context-root management. The API supports GET requests to execute read only operations and POST request to execute write and read operations. The default operation of a GET request on a resource is read-resource. Other read operation can be executed via query params, as shown in the example below. The API supports all generic operation with the read prefix. Parameters can be passed to the operation with query params. The query parameter ?json.pretty formats the JSON String and makes the response body more human readable. To execute commands that change the configuration, POST requests can be executed. The body payload of the POST request is the node representation as a JSON String. The node representation includes the operation, parameters, and the address of the node resource. The following request is an example to change the value of the default transaction timeout. This operation also writes the changes to the XML configuration file. The resources can only identified with the address in the model node representation and not with the URI. 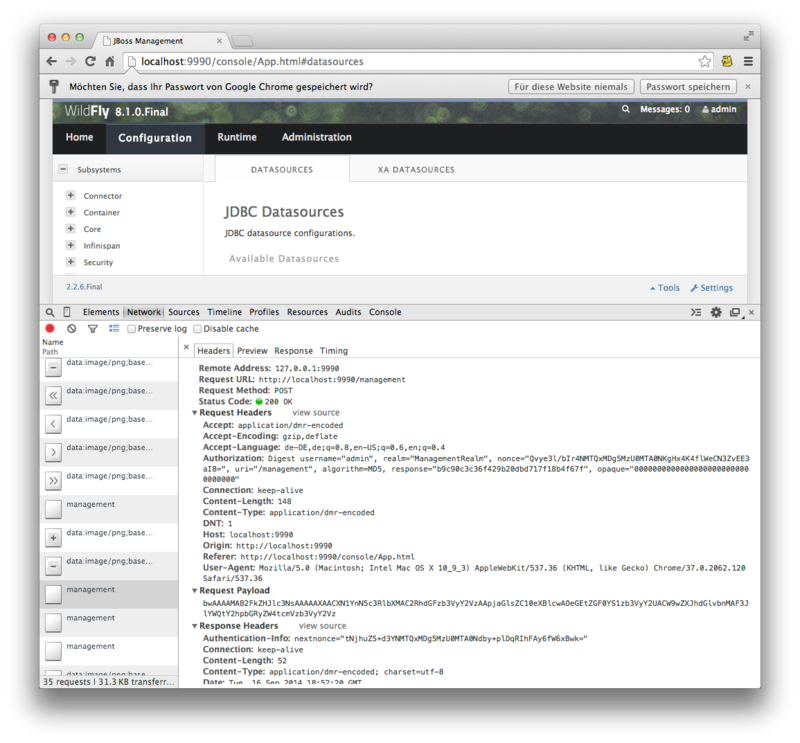 The JBoss EAP / Wildfly Application Server comes in addition with a Web-based Console. The console can be accessed via the same port as the other management interfaces. The URL is http://host:9990/console. The console offers intuitive user interfaces for configuration tasks, management of host, and server instances and UIs for operational tasks. The Web-Console is a GWT-based application. It interacts with the server through the REST-based interfaces. The only difference is that the Web-Console uses the DMR-specific representation of the model node as content-type. By default all resources are exposed as JMX Management Bean with the ObjectName jboss.as:*. These MBeans can be accessed, for example, with the JConsole or programmatically. The Wildfly Application Server provides the script jconsole.sh to start the JConsole with the Wildfly client libraries. The script is located in the bin directory of the application server. 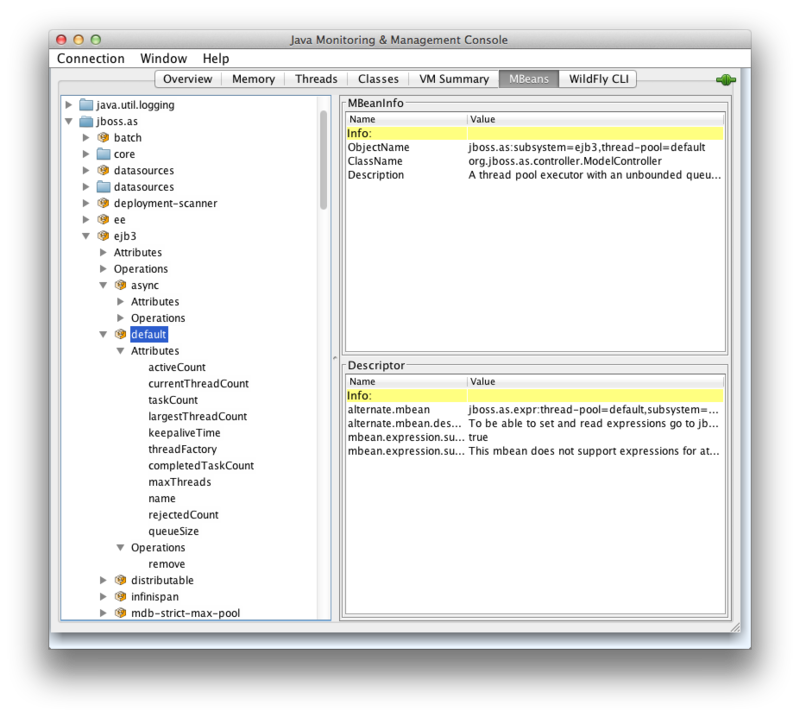 The client libraries are necessary to connect the JConsole with a remote Wildfly JVM process via a JMX service URL and the remoting-jmx protocol. The JVM process does not need to be started with additional JVM options. In this case the connection is secured with the ApplicationReam and Application User. 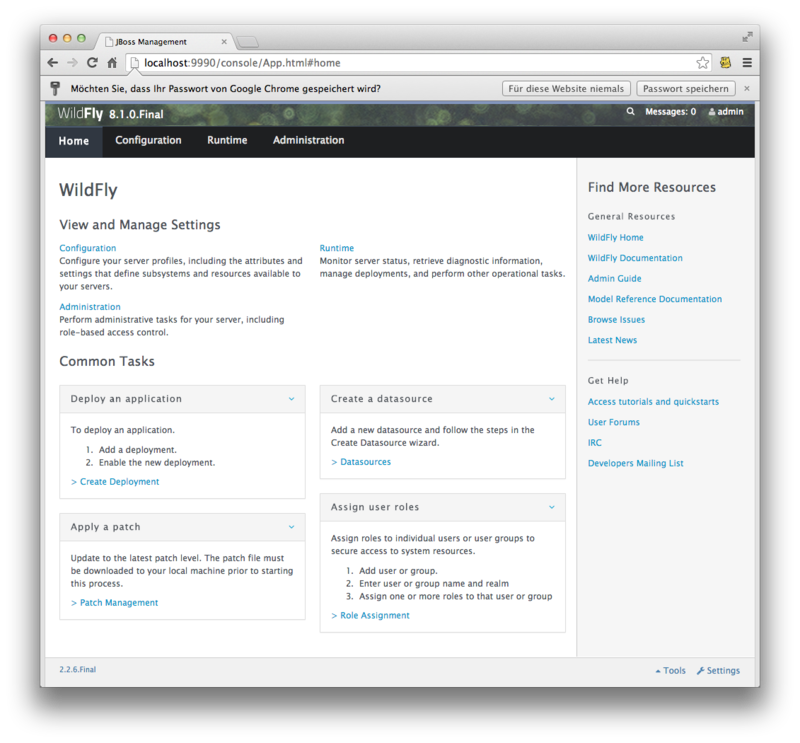 The Wildfly Application server offers in addition a Java API to implement a custom client. The class org.jboss.as.controller.client.ModelControllerClient implements a factory to create a client and establish a connection to a server instance. The application server provides many ways for the management, monitoring and configuration. This allows the seamless integration of the management interfaces in existing DevOps tools and monitoring tools. Especially the REST interfaces allow the integration in heterogeneous environments. With the generic management model, it is possible to obtain a complete overview of the current state and the current configuration of the application server. Remember the good old days when we had to configure thousands XML files. Reblogged this on java web development.